Rochelle (46) suffered from excessive sweating for the best part of two decades. Like most people who have been affected by the condition, it made her life a misery until she stumbled upon a cure that allowed her to start treating excessive sweating rather than letting it control her life. Here are her thoughts on what it’s like to experience excessive sweating on an everyday basis and how she has successfully turned things around. Rochelle found that excessive sweating had a major hold on her life. “I was conscious of what I should wear all the time and of course, the summer was especially worrying as people tend to sweat more when it’s warm.” Choosing her outfits was problematic, not least because it revolved around selecting the kind of clothes that would be more likely to conceal the problem - but this could be a vicious cycle that actually made the problem worse. “I would keep my jacket or cardigan on to cover the sweat or wear sleeveless clothes, but even then I had to worry if it would show through.” This created something of a vicious cycle, as Rochelle notes, “Of course, the more you worry, the more you sweat!”. Armed with the recommendation, Rochelle made it her mission to track down the product to try for herself. “I went to the chemist and discovered that they had one bottle available at the pharmacy department (not on the regular shelves) so I bought some and used it that night. Initially, I accidentally used too much and made my underarm area sore in my haste to see if it worked. 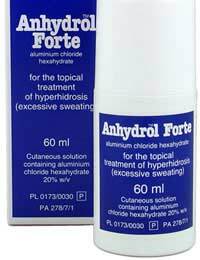 To my relief, the excessive sweating stopped within a week. It was like a miracle!” Rochelle used the product for a month and was amazed at the difference that it made. These days, she is no longer affected by excessive sweating. “I don’t sweat under my arms at all now. Even in the warmer weather that would have created massive anxiety in the past doesn’t bother her.